The revolutionary “Leaving Cert Irish” App is now available for download from both the iTunes Store and the Google Play Store. 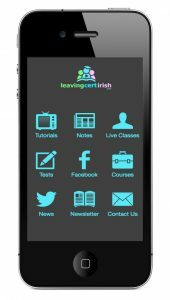 The Leaving Cert Irish App is going to radically improve the way in which you prepare for your Leaving Cert Irish examinations, at both higher and ordinary level. Tutorials – detailed recorded lessons that are made available to students during the academic year. Notes – every single video on the app has an accompanying set of notes, available to download as a PDF. Live Classes – live streamed classes, where students can ask questions and get live responses. Tests – vocabulary flashcards, memorisation tests, and customisable written tests. The ‘Courses’ section of the App will become available very shortly. It is envisaged that highly specific sections of the course will covered here e.g. béaltriail, litríocht, próstéacs breise, ceapadóireacht etc.